Accidents do happen, and White Mountain Regional Medical Center is right in your neighborhood to provide help when you need it most. The Hospital's 24-hour, 7-day a week Emergency Department is designated as a Level IV Trauma Center and certified as a Pediatric Prepared Care Emergency Department. We are staffed and equipped to handle all forms of medical emergencies, ranging from heart attacks to minor injuries. Physicians consist of a small core group of providers and are on site 24-hours a day, every day. The Emergency Department provides a central heart monitor system, specialized trauma room, women's health rooms, critical care areas, and pediatric specific equipment and supplies. When you arrive at WMRMC, you will be escorted to Triage. The Triage nurse has special training to quickly evaluate medical needs and will assess the severity of your illness or injury. Depending on the severity of your medical needs and the needs of other patients this will determine who will be seen first. While many of our state's finest emergency facilities are facing critical manpower shortages and long lines, the White Mountain Regional Medical Center's Emergency Department stands ready to serve with little or no waiting. Armed with a staff with years of experience, our medical professionals are prepared to help in your time of critical medical need. Providers and nurses who specialize in emergency medicine will care for you. If indicated, a consulting physician specialist can be called. Your nurse will monitor your condition and keep you informed. 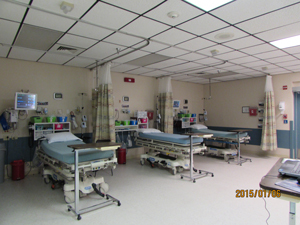 The emergency department has 24-hour-a-day access to the hospital's wide range of services. The ability to order a variety of on-site services such as lab tests, x-rays, CT and ultrasound makes for swift and thorough patient evaluations. If necessary, you may be admitted to the Medical/Surgical unit for up to 24 hours for observation to rule out an acute medical condition or observe your progression. In the case that we can not provide the care needed a transfer will be arranged to a more appropriate facility. If you are not admitted to the hospital, you will be discharged from the Emergency Department with a written plan of care. If medication is prescribed after local pharmacy hours, you will be given a small amount of medication for the remainder of the night. Your primary care provider may receive a report with follow-up recommendations for your care. Family members are welcome in both the waiting area and, when possible, in the private emergency exam areas. If you are the patient and bring young children with you, please bring someone to supervise them. Most insurance companies do cover part of an emergency room visit. If possible, it is a good idea to check with your insurance provider prior to your visit. However, during a medical emergency, do not hesitate to call 911. WMRMC will make sure you are seen by a physician regardless of insurance or ability to pay in the event of an emergency. Keep in mind, WMRMC will accept most major insurance providers. The Emergency Department staff consistently receives top marks on surveys completed by patients and their families. Not only does the ED staff meet our patients' needs, but their goal is to exceed the expectations of the people we serve.